A civil defense member breathes through an oxygen mask, after what rescue workers described as a suspected gas attack in the town of Khan Sheikhoun in rebel-held Idlib, Syria April 4, 2017. Scores of civilians in northern Syria have been killed and hundreds of others wounded in a toxic gas attack that observers, diplomats and analysts are blaming on forces loyal to President Bashar al-Assad and their Russian allies. An umbrella organization of Western relief groups early Tuesday put the death toll at the Idlib provincial town of Khan Sheikhoun at 100 with more than 350 others stricken. Russia has "categorically denied" any role in the attack. 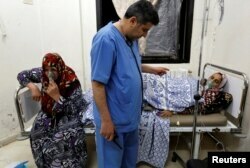 Syria's government has repeatedly denied using chemical weapons against civilians throughout the six-year war. The United Nations Security Council will address the bombings at Khan Sheikhoun in an emergency session Wednesday morning. Far to the south, monitors from the Syrian Observatory for Human Rights said at least 25 others, many of them women and children, were killed Tuesday in airstrikes at several sites east of Damascus. The gas attack at Kahn Sheikhoun, described by the opposition Syrian National Coalition as a "horrifying massacre," is widely believed to be the worst such violation of international law in war-ravaged Syria since 2013, when a U.N. probe found credible evidence that sarin gas killed hundreds of civilians near Damascus. In the latest of many declarations of outrage, the global relief agency UNICEF said, "These attacks must do more than provoke our outrage; they must compel action by those with the power and the ability to bring an end to this devastating violence." Earlier Tuesday, a reporter for the French news agency said one missile at Khan Sheikhoun slammed into a hospital where some of the victims were being treated, bringing down rubble on medics as they struggled to treat victims. A still image taken from a video posted to a social media website on April 4, 2017, shows a civil defense member helping a child who is being sprayed with water, said to be in the town of Khan Sheikhoun. The attack, which caught many of the town’s residents sleeping in their beds, came on the eve of a major international meeting in Brussels on the future of Syria hosted by the European Union’s chief foreign affairs official, Federica Mogherini. At one point Tuesday, government-owned media outlets suggested that a conventional airstrike on rebel targets at Khan Sheikhoun may have hit a rebel chemical weapons factory or stockpile. The Syrian National Coalition called Tuesday for an emergency session of the United Nations Security Council, blaming the airstrikes on the “regime of the criminal Bashar.” In a statement, it said government warplanes fired missiles carrying poisonous gas. The coalition urged U.N. officials to "open an immediate investigation" and take the necessary measures to ensure the officials, perpetrators and supporters are held accountable. A still image taken from a video posted to a social media website on April 4, 2017, shows a man lying on the ground and being sprayed with water, said to be in the town of Khan Sheikhoun. The reported attack on Khan Sheikhoun to the west of Aleppo and south of the city of Idlib, the provincial capital, is the third claimed chemical weapons attack in just over a week in Syria. Another two blamed on the Syrian government were reported in Hama province, not far from Khan Sheikhoun. The type of chemical agent used Tuesday is not clear, but some opposition websites said highly toxic sarin gas may have been employed. Some medics working on the victims also pointed to sarin as the agent most likely used. “We have no doubt that this is a sarin attack,” said Dr. Shajul Islam, a British medic working in a clinic, which received three of the victims. He posted a video on Twitter showing the victims with pinpoint pupils, which were unresponsive when light was shone on their eyes. FILE - Women, affected by what activists say was a gas attack, receive treatment inside a makeshift hospital in Kfar Zeita village in the central province of Hama, Syria, May 22, 2014. "The medical situation is very bad, due to the lack of hospitals and because the regime targeted all the field hospitals used for treating victims," he added. Earlier this year, the New York-based Human Rights Watch accused the Syrian government of mounting eight chlorine gas attacks on insurgent-controlled areas during the final weeks of the battle for Aleppo. A joint investigation by the United Nations and international chemical weapons experts blamed the Syrian government for at least three chlorine attacks in 2014 and 2015. Idlib province is one of the last strongholds of anti-Assad rebels and U.N. analysts estimate there are nearly a million displaced Syrians in the province, many from Aleppo.